You lose a button off of your favorite shirt. What do you do? Your son receives a pair of pants where the length and fit is perfect but the waist is just too loose. What do you do? You accidentally rip the hem out of a really nice shirt, leaving it looking raggy. What do you do? Without basic sewing skills, these items of clothing are either headed for the rag bag or the yard sale or else into the hands of someone you pay to repair such items for you. In either case, there’s either a sharp loss in value or a direct cost to you. With basic sewing skills, these garments are mended in short order, which means they continue to be useful pieces of your wardrobe and save you from the expense of having to buy a new one. The nice thing is that most simple repairs for clothing only require a needle, some thread, and a bit of know-how (and perhaps a bit of practice). You don’t really need a sewing machine for any of the above tasks. Give me some thread and a needle and I can easily fix the first and third problems, and without looking at guides I can make a pretty strong attempt at the second. The key is to try. If you don’t try, you have a useless garment, which is the same exact situation you’re in if you try and fail at something like this. The best place to start is by learning a few basic techniques, particularly how to thread a needle. Once you have those very basic things down, all you have to do is Google for the project you want to tackle. 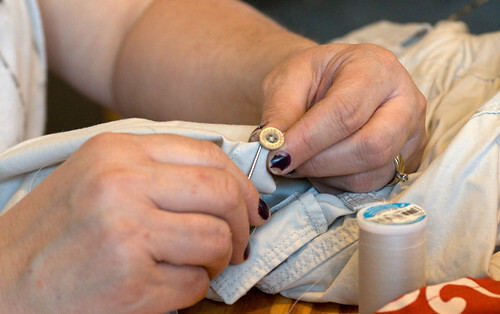 There are great visual guides for sewing on a button and even more complicated things like hemming a pair of pants. What does this have to do with saving money? Ask yourself this. Which is more expensive: a sewing needle and a bit of thread or a new shirt? That’s the advantage of having basic sewing skills. You no longer have to stop wearing clothes because of minor damage. You can fix them yourself, quickly and easily.